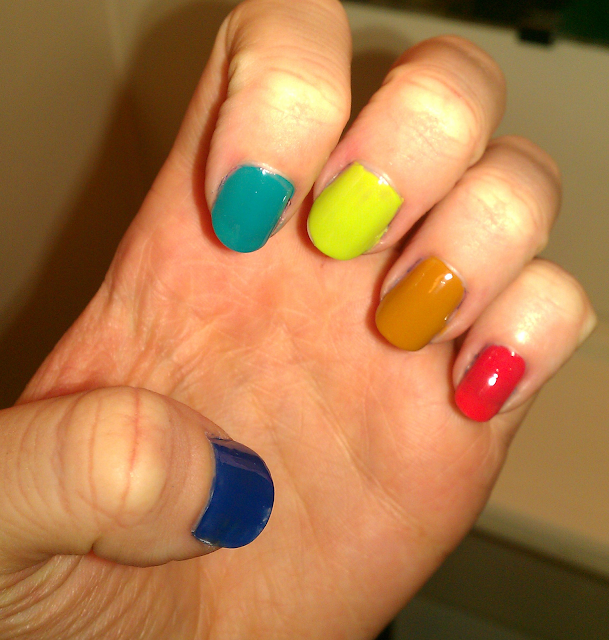 I like fun nails during my days at Uni. As we're allowed no make up, I make sure I make my nails as amazing as I can! I hadn't tried my Ciate Colour Smash varnishes yet (I got a set of the silver, black and white last year on a trip to Northampton) so I decided to try it out. I wasn't sure what colours to use as the base so I used a bunch! Dating A Royal - OPI - A gorgeous deep electric blue inspired by Kate's engagement ring. The formula is great, as I know a lot of OPI's can be hit and miss. It has a long wear too! Fly - OPI - A gorgeous teal colour. This is one of my to go to polishes as it just looks stunning on the nails. This is part of the Nikki Minaj collection. Green With Envy - Sally Hansen - A lovely lime green. It's a dream to apply as it's creamy formula is so easy to work with. It has great wear too. Hampstead Gardens - Nails Inc - A gorgeous brown/yellow which is set to be a 'trend shade'. This was all over the catwalks last autumn and I expect it to make a return! I wasn't huge on the wear of this as I find Nails Inc chip not long after application. Chubby Cheeks - Essie - I love this colour! A gorgeous coral with a pink tone to it. I am completely in love. I think the wear to this is very similar to OPI. However this shade had a better pay off compared with many OPI shades I have. White Ciate Colour Smash. I love this. It has a better wear than a lot of crackle effects as many of them rub off, but this baby stays put. You can get this online from Ebay, Amazon etc, but not from Ciate anymore I'm afraid! Search online for it or outlets, I've seen these in TKmaxx a few times. These look amazing.You're so talented. This effect looks really similar to the Barry M cameleon polishes! They look great ! I have the black crackle but sometime I think it can be a bit much. but the white looks amazing. Aww this is so cute and pretty! Very bright and bold colours and the white crackles make them so different. Love it! Also, I'm having a giveaway on my blog for my followers and would love it you entered as well! How come you're not allowed to wear make-up? At least you can brighten up your nails, they look fab!! your blog is beautiful, following asap! Thanks for co-hosting the blog hop and I'm your newest follower:) I absolutely love your nails, very pretty:) Have a good evening! So fun! I recently got a crackle polish and I'm dying to try it out. I love that you used different colors on each nail! 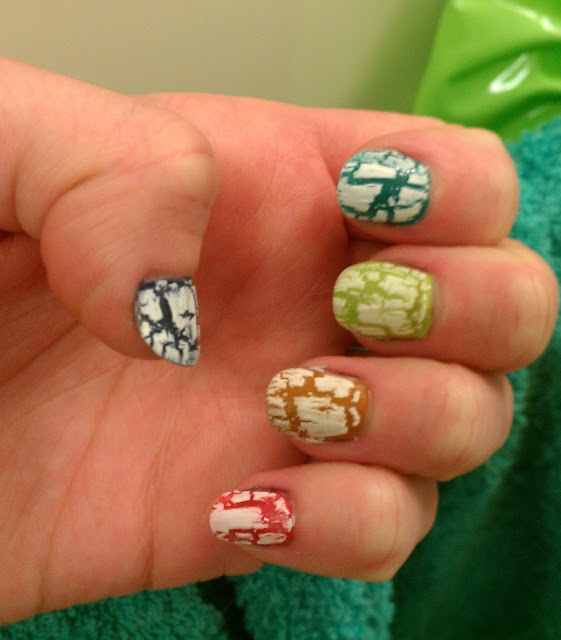 What a fun inspiration for when I try my crackle. I just found your blog, and it's so useful and full of pretty things! I'm your newest fan and follower. Let's be blog friends?